Discussion in 'Stock 2002 - 2005 Explorers' started by mbrando1994, October 16, 2015. Hi all, I've been hearing a strange metal popping sound coming from the rear suspension ever since I took my car to the garage to have a bolt drilled out (front sway bar bushing bracket). It sounded like a spring to me but honestly it could be anything. To me it looks like the spring is about to unravel off of the mount. Am I wrong? There's some kind of rubber boot also hanging off the tail end of the coil. Clearly this isn't in the best shape but how bad is it? Could this be causing the noise I'm hearing? You've lost a portion of the spring. Time to replace the whole assembly. What's about to happen, is the spring is going to push off the bottom support. definitely a bad spring. it is also worth mentioning that you really should get both of them done. Monroe Quickstruts are really easy to install. well worth the extra money to save the time/danger of rebuilding the strut. Thanks guys, this was my worst case scenario since I just had to do both front UCA assemblies...but safety has no price. Is this something I should tackle on my own, as you said I am very terrified that the coil will pop off during removal. I'm assuming I should really baby this until I can get them replaced.. If you can do the UCA's, then you can do rear struts. You can replace just the one if need be. I've never really done any major suspension work yet. I'm doing the UCA's a week from today. Getting a friend to help out who has air tools. I know the process of replacing these struts I just am weary about going in there if this spring is a ticking time bomb. Any advice on getting this off without the spring popping? Or is this more stable than I think? If you are replacing the complete assembly, it shouldn't be bad or too hazardous. you are removing the bolts from the top, then removing the big bottom bolt. You won't even touch the spring if you are removing the assembly and replacing with a new complete assembly. I wouldn't mess around with it, but once you loosen the bolts, with the truck off-loaded on a jack, the spring shouldn't be under a heavy load and should be easy to remove. Alright, thank you guys for all your help and advice! Would it be a good idea to rent a spring compressor kit just in case? I'd rather be safer than sorry. Also do you think I could drive this for the rest of next week until I can do the job Saturday? I'm not a mechanic, but I think using the spring compressor is more hazardous than just taking out the assembly as one piece. I'm not a fan of using a spring compressor, even as a "backup" thing. 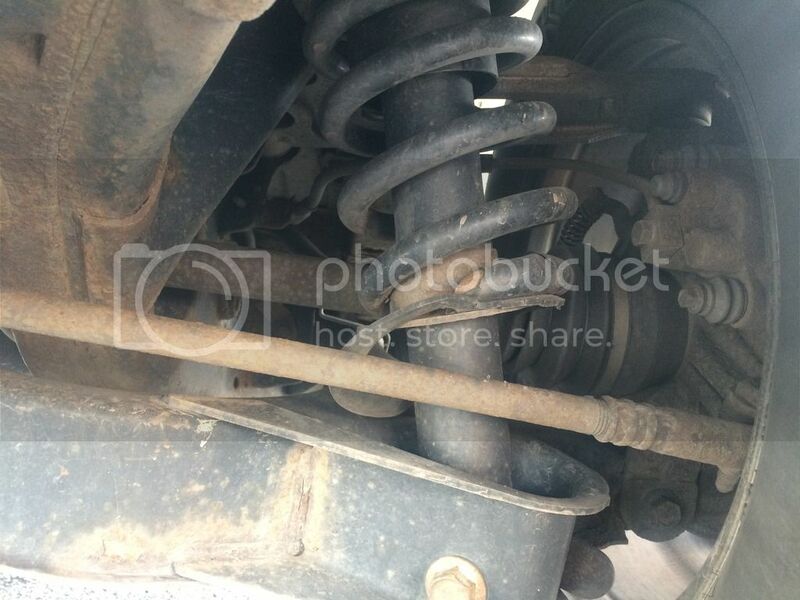 As for driving it, it should be okay for a week because even if the bottom support breaks off, the spring can only decompress so far and it will stay connected around the strut. I know what you mean apenland. I do plan on removing the assembly as a whole. What I mean is what happens if while removing it, the bottom mount decides to break? That wouldn't end well I don't think. I just don't want to get hurt or see anyone else or any part of the car get destroyed. Also, is it safer to handle it by holding the spring itself or by holding either end of the assembly? Since the spring could only decompress, there should be nothing hazardous about holding the middle of the spring itself when removing correct? I think Monroe is offering their "Shocktober" promotion for the quick struts. I'd check it out. you could take the whole assembly out without worrying anything to fly out. it's only when using the coil spring compressor that you have to be careful about. since the shock absorber is probably toast by now, you're better off buying a complete coil over assembly. it's a little bit of a challenge to swap coils with the explorer since they are relatively larger and heavier. You'll be totally fine. Just pull the top bolts, then the bottom and it won't be loaded. You can do the job quite easily. I replaced all 4 on my truck couple weeks ago. It took me several hours because you are fighting with old and rusted bolts. You will need to replace the sway bar links also. I got the Monroe struts and they are great. I recommend doing all 4 since the new struts are taller then your old ones.